Melaka International is a most annoying circuit. Especially on something as potent as the Honda RC213V-S. And trying to make the exit of turn 2 as elegant as possible seems impossible. The smooth Honda suddenly feels like all the frenzy of an energetic six-year old on coffee stuck in a very small box with no toys. And even in that you're conscious of three things. First, despite what it looks like in the photos - which is unsharp, slightly longish and sort of, er, oblong - it's a compact, velvety smooth shape. Unlike all the sportsbikes that come to the moto-festivals and chase their own redlines and lunch their valves, the RC213V-S looks longer and lower, rather that sharp and tipped on its nose. You get the clear sense that the RC responds in shape to its function far more closely than the average sportsbike. Those need to look good. This one just needs go as fast as humanly possible. Second, this is a very small motorcycle. Not that the new 2017 Honda Fireblade is a very large motorcycle anymore, but the RC213V-S has all its violence contained in a very compact space. It's hard to imagine that this pinnacle of performance motorcycling, aeons faster than the 'Blade is this much lighter and a bit smaller than the top production Honda sportsbike. The Honda technical briefing document, in fact, notes that the yaw intertia - how the bike turns - is less than both 1,000cc and 600cc supersport machines! But the riding position is even more telling. The clip-ons are set close, most of the fuel tank is actually under the seat and you're gripping a narrow 'tank' designed for its volumetric needs as well as for the knees to find secure, steady purchase for cornering. I was surprised at how uncramped the riding position felt. But then again, it was a short time on the bike and maybe I am embellishing my own memories of the RCV. It's either that or I'm younger and bendier than I look. Third, and this is the important thing, it's so freakishly light! And that's the real story. As you know already, the Honda RC213V-S was designed to be as close as possible to the race-going MotoGP bike that Marc Marquez and Dani Pedrosa race 18 Sundays a year. 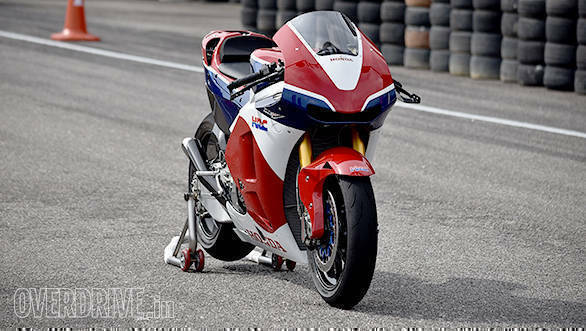 The RCV-S in stock form aims to replicate the handling feel and capability but not the engine or performance. Which is why a surprising number of parts are actually interchangeable with the race RC-V. 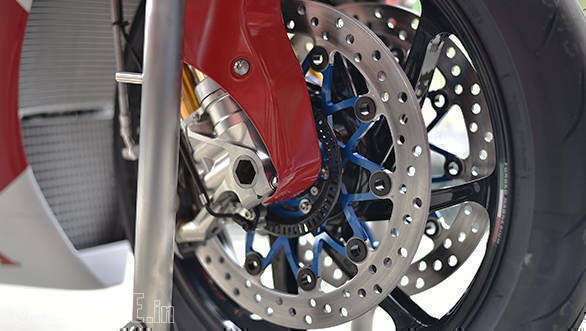 So your $188,000 (Rs 1.2 crores, approximately) buys 17-inch V-S Marchesini magnesium wheels. That's the lightest you will get. 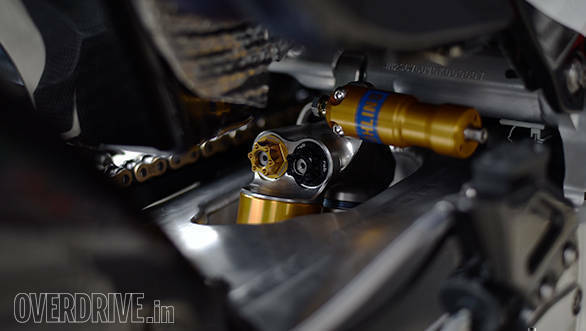 The suspension is the same Ohlins TTX25 forks and the Ohlins TTX36 rear suspension that the racebike gets. You also get the same adjustable rear sets and foot controls. The Brembos are the same exact spec. Also identical are the throttle-by-wire systems, the power modes, engine-brake control and the position-aware traction control system. Indeed, as a Kevin Cameron's report (in Cycle World) from the RCV-S launch said, the only things that his magnet stuck to were the brakes. The rest is titanium. The fairing, again, is CFRP, or carbon fibre reinforced plastic, virtually identical to the ones that wear the orange paint on race Sundays. All this adds up. When you turn the Honda RC213V-S into a corner, the sense you get isn't of you riding a big machine with big power. You get the sense of an ultra-smooth, ultra-friendly (yes, I was shocked too) machine that responds to the inputs with a level of telepathy, feedback and reserve that you didn't think was possible. It's a familiar manner that you'd think unworthy of comment until you realise that it's the first lap post the sighting lap and that in the excitement of riding the Honda, you've forgotten whether it's running street tyres or slicks. But the Honda uncoils smoothly through the long Turn 3 before ducking into the kink that is Turn 4 easily. It's a narrow, tight place with iffy tarmac, no run-off at all, and this is a very, very, very expensive motorcycle. No pressure. No really, the RCV-S seems to have leagues of grip left and the patience of Mother Nature itself for my fumbling stabs at establishing control. But some of this is also shrewd event design on HRC's part. 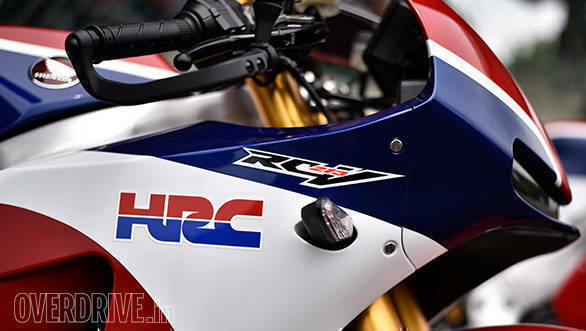 You see, the RC213V-S experience was the kick-off for the Honda Asian Journey 2017 and riders of all kinds of skill levels from rudimentary to ridiculous were likely to hop into the RCV-S saddles and put a few laps behind a local racer who would set the pace. To that end, the engine, already a strangled version for street legality was throttled back further. 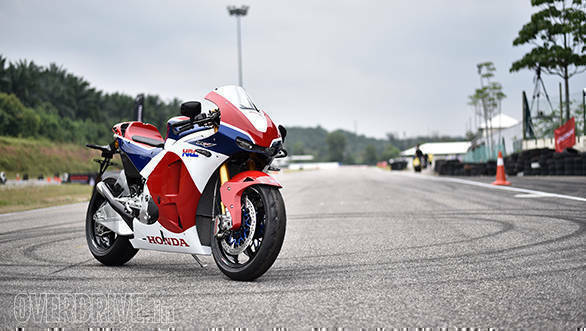 To wit, the $12,000 power kit really unlocks the full power - over 212PS says Honda - of the RCV-S and renders it street illegal. In the power kit is a new ECU, ram-air ducts, reverse-pattern shifter drum, new brake pads, quickshifter, datalogger, exhaust and more. But the European bike revs to 12,000rpm as stock and makes around 160PS. The American bike - tighter norms, revs to below 10,000rpm as stock. But here, HRC took the redline down to 7,000rpm. Then again, the Japanese-spec V-S is 68PS at 6,000rpm. Epic. 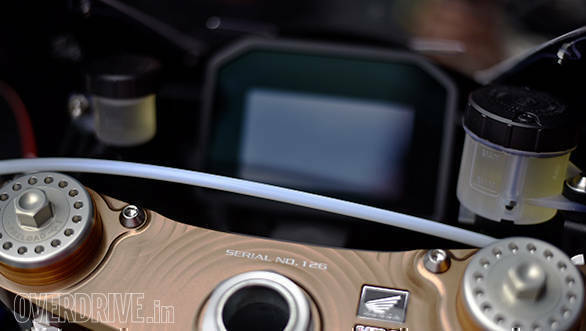 So the RCV-S felt like it had 80-90PS of play time before you ran into the ultra-soft limiter. The limiter is so soft that the first time I thought the engine was bogging down and unable to rev. It also meant that the short straight is flat out in fourth gear, I even got into fifth on one lap. Any racer around the world would hear that and think you're Marc and Dani's lost brother. 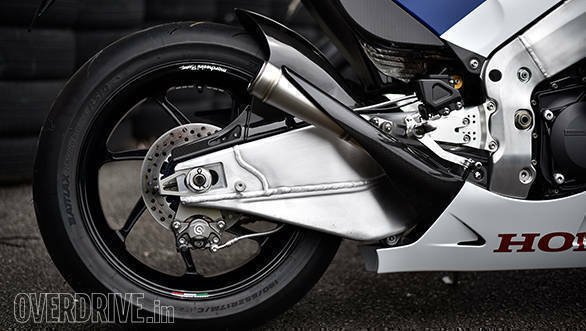 The truth is that's nowhere close to how fast the RCV-S will go even in stock form and it felt sometimes like I was just shifting, shifting, shifting all the time. Sometimes because the limiter was so low and sometimes because the revs had dropped a bit too much. Then again, all kinds of riders, tight track, no run-off... I would hardly have done any different if I were the HRC. Which is why I don't know how the electronics work or don't. The bike felt good but I don't know what settings it came with and what difference messing with them would make. But let's get back to what we do know. Turn 4 leads to another set of turns that cascade until you exit out on the back straight. This exit is a left-hander which throws you into a shallow curve left and right before you get a moment of full throttle before you start shedding speed and gears for a first or second gear hairpin on to the main straight. Through all this turning and direction changes, the Honda feels effortlessly light and confident. Every time the bike feels like the tightness of the circuit is winding it up, it sort of uncoils and unclenches and it's a beautiful feeling. My ultimate takeaway from the experience was that even the severely restricted RC213V-S revealed how easily the Honda gives you the confidence to trust it and try to ride it harder. Unknown track, expensive motorcycle and a legion of HRC and Honda staffers in the pit lane with their hearts in their mouths. And yet, a lap later, you've nailed the gas out of three corners (for what its worth) with full confidence. Never before have I ridden a motorcycle with this level of latent performance that felt so easy, so calm, so smooth and so in sync with what I wanted to do. My eight-odd laps came to an end rather too quickly and the impression I have of what the Honda RC213V-S is and can be is faint and fleeting. But the Honda is unmistakably an achievement. It's like look at a really bright light through a fog. You sense the brightness of it but can't really make out the details. But if it weren't the fog, the light would blind you and you'd see nothing at all. + So smooth, so confident, so exotic! 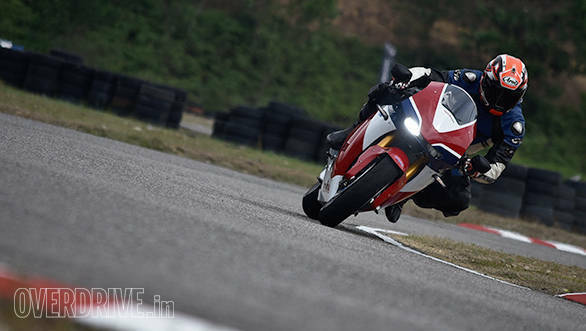 Honda Asia organised their first Asian Journey event last year and this year they expanded the event to include Indian media and riders from Vietnam. 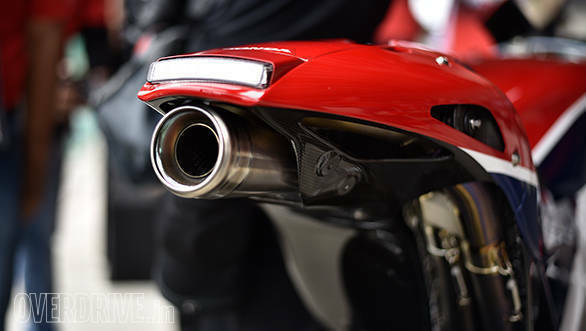 The riders from these two countries joined a mixed group of owners and media from Malaysia, Indonesia, Thailand and Philippines for a 600km ride in Malaysia culminating in the qualifying and race sessions for the Malaysian Grand Prix. It was our chance to sample a selection of Hondas that may or may not be relevant to India both in terms of future (undisclosed) products, but gives us a chance to see what Honda is up to in terms of technology or product design. These stories are a selection of the motorcycles OVERDRIVE got to ride. We rode mostly the big highways in a fairly regulated convoy because of the range of rider skill and experience in this 46-motorcycle group. So the riding impressions are less detailed than usual.